This is a comforting dish to put together on a rainy cold day. 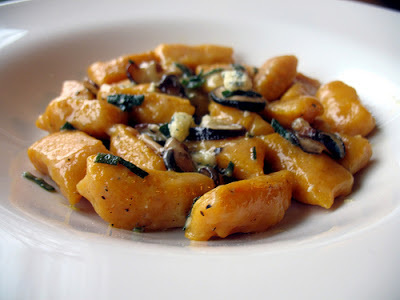 The gnocchi is surprisingly easy to make...they come out light and have a buttery texture. They pair perfectly with a sage butter sauce and the kale and sausage adds the perfect touch! Prepare your squash. If you are using fresh squash, remove the seeds and cube into 1/2 inch pieces. Place onto baking sheet and roast in a 350 degree oven for about 30 minutes or until tender. If you are using frozen squash, defrost according to package instructions and drain out any excess water. For either method, place into food processor and puree. Measure out 2 cups of the squash. Place 2 cups of squash into a medium sauce pan and place over low heat until some of the liquid has evaporated out. This is will take about 10 - 15 minutes. Once squash has cooled, place into a bowl and add in the egg, salt & pepper and dash of nutmeg. Slowly add in flour a little at a time stirring until the mixture comes together. Pour out dough onto floured surface and knead until the dough has completely come together. Roll dough into about a 1 inch wide thin log shape (you may need to make more than 1 depending on your space limitations). Cut into 1 inch pieces to form your gnocchi! Place finished gnocchi onto wax paper and continue process for remaining logs. Cook gnocchi in a large pot of salted boiling water for 2 minutes or until they come to the surface. Serve with a brown butter sage sauce or with the recipe below! Cook sausage in a large skillet until no longer pink. Remove from skillet and reserve on a platter. Add chicken broth to same pan and heat until simmering. Add in the spinach and dash of nutmeg and sage and cook over medium heat until spinach has wilted. Add in butter and swirl until melted. Place sausage back into pan and stir to incorporate with the spinach. Sprinkle in the Parmesan cheese and red pepper to taste. Pour over gnocchi and serve!